Imali Perera playing recurring role, 'Nurse Marielle', on Degrassi Next Generation to Clare during her cancer story line. I think this still is when I say "Va Vavooooom!!" to Clare dressing up for her big date night. Imali Perera as 'Magda/Baroness of Anarchy' in the superhero short comedy "Hell Hath no Fury" written by Devjani Raha, directed by Dug Rotstein, and produced by Rob Fisher. Too much fun wearing THIS outfit!! 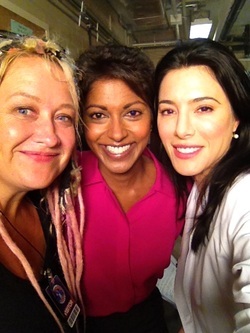 On set of "Warehouse 13" with the fabulous Jennifer Lynch, director, and phenomenal Jaime Murray (plays : Helena G. Wells). Both super super sweet!!! We started a new satirical feature we're calling Minority Retort. It's a political panel - of sorts - hosted by the unflappable Dan Ratner. Clearly having an intensely fun time with Jane and Micah. We croaked, buzzed, warmed up, sang, improvised, sang ALOT and laughed even more! Pictures were taken by Brian Quirt and Martin Julien, as they watched and documented us. 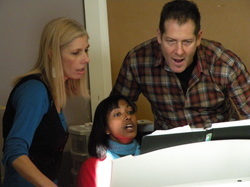 Photos from our recent "Wolf" workshop, featuring (l to r): Jane Miller, Imali Perera and Micah Barnes. The Wolf in the Voice Further developing the ideas and techniques used in 2008's Blue Note, Brian and Martin Julien held the first sessions on a new project exploring the inner workings of the singing voice. Working with a fabulous trio of singers – Micah Barnes, Jane Miller and Imali Perera – the workshop looked at the most vulnerable spot in any singer's range, the so-called 'wolf in the voice', the vocal break. Look who is the Covergirl of her first magazine! 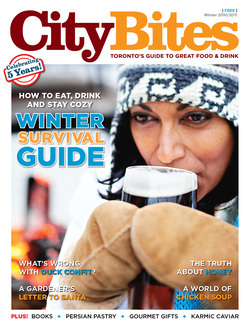 How appropriate that it is Toronto's Winter 2011 edition of "CityBites", and that I am downing a pint....now I just need to be on a cover drinking a pina colada listening to the roar of the ocean! Brrrrrrrr. 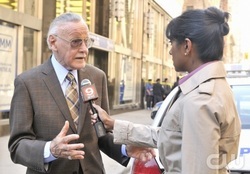 Onset of "NIKITA", 'The Guardian', with Stan Lee, the founder of Marvel Comics. He was a rock star, and very very sweet. "A stellar cast brings all the snapshots of India and Canada to life. Firstly, there is 91-year-old Zohra Segal as Granny. Segal, one of the undisputed grande dames of Indian theatre, is always a pleasure to watch. Imali Perera as Tina is enchanting. She conveys Tina's alternating emotions of despair, amazement and delight with great finesse. Zaib Sheikh owns the role of Tommy, full of its conflictions. " Imali playing role of 'Tina' in 'Rice Boy' at Canstage opposite Zohra Segal.
" Zaib Shaikh delivers an astonishingly realistic performance as Tommy, a character less than half the actor's actual age. With childlike curiosity, Shaikh uncannily captures the chasm between childhood and adolescence. Imali Perera's Tina is his match both in character and performance-silence to his exuberance, stillness to his wandering, and, with her character's final decision, clarity to his confusion. While the entire cast deserves praise for bringing genuine emotion to Kuruvilla's unique text, Zohra Segal's performance as Granny must be singled out alongside Shaikh and Perera."